By request here is more information on configuring the Draytek 2600 router to allow the Sure signal to work reliably. First you need to give the Sure Signal a fixed IP address, on the Draytek 2600 this means using a telnet session into the router. To do this you need an appropriate telnet program. 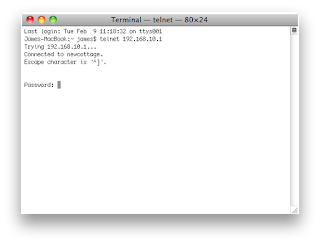 If you are using a Mac that is easy as "Terminal" is built in, PC users can download the free PuTTY from here. You need two things before you do this (a) a spare IP address on our network and (b) the "Mac" address of your Sure Signal. To find a spare IP address just take a note of your router's IP address, for example this might be 192.168.10.1 you can choose any IP address in the same 192.168.10.X range so 192.168.10.3 for example. The digit just needs to be a number no greater than 253. (If your routers address was 192.168.0.1 you might choose 192.168.0.200) in general choosing a high number is the best option. First restart the router then when it has started back up and your PC is connected to the network start a "telnet" connection to your router (using Terminal or PuTTY, see above). Note that the Mac address MUST be in this format, ie split with each two digits separated by hyphens or it won't work. Provided you don't see an error all is OK! That's it! Hopefully it should work fine now, re-boot the sure signal and check it works.